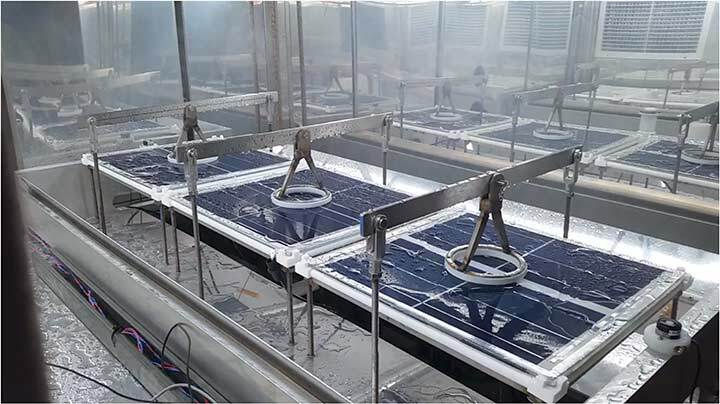 DuraMAT provides access to photovoltaic (PV) module fabrication facilities and develops module testing methodologies. We currently focus our test method development on accelerated tests, including combinatorial accelerated testing. This provides access to a variety of environmental chambers and accelerated test facilities to compare test conditions, module/material performance, and testing protocols. Module prototyping and testing provides opportunities to fabricate new module designs or directly compare materials in accelerated testing. It’s difficult to introduce new materials and module designs into the PV market because they are unproven in the field. To reduce that risk, we provide technical expertise in characterization, accelerated testing, and module performance. To learn more about this capability area, contact Peter Hacke.